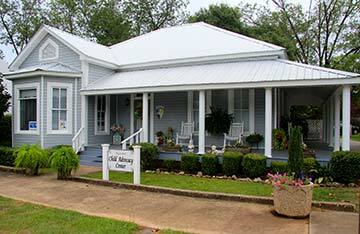 The Regional CAC has a Choctaw County Satellite Office that is located in Gilbertown in Town Hall. When there is a report of child sexual abuse or serious physical abuse in Choctaw County, the team gathers to begin the investigation. The CAC staff and members of the MDT meet the family and child at the Satellite Office where a forensic interview is conducted in a child-friendly place and the team makes plans for the next steps and for services needed by the child and family. The Choctaw County MDT also meets every two months to review all open Choctaw County Cases in order to work together on these very difficult cases. The members of the MDT, who are dedicated to helping children, realize that working together makes everyone better at their job and is the best way to have good investigations where the outcome is the successful prosecution of the offenders. The MDT consist of representatives from: Choctaw County DHR, Choctaw County Sheriff’s Office, Choctaw County Juvenile Probation Office, West Alabama Mental Health Center, Gilbertown Police Department, Butler Police Department, Pennington Police Department, Silas Police Department, the District Attorney’s Office and the RCAC Staff.